Please note that the body and wing sketches are not in proportion to one another. The wing needs quite a bit of adjustment, but I like how the engine turned out. 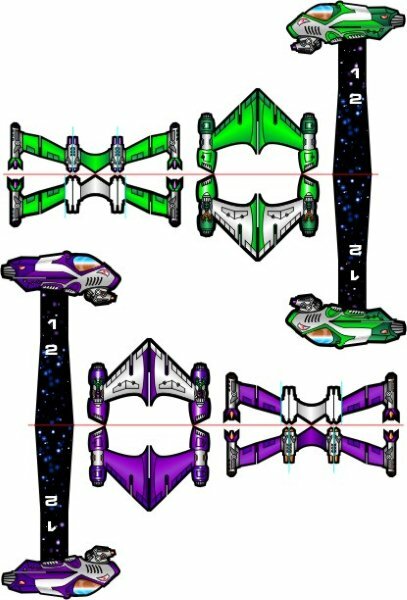 The game rules still need quite a bit of work, as my turning templates didn't work out quite as I thought and I'm having trouble with the collision rules. 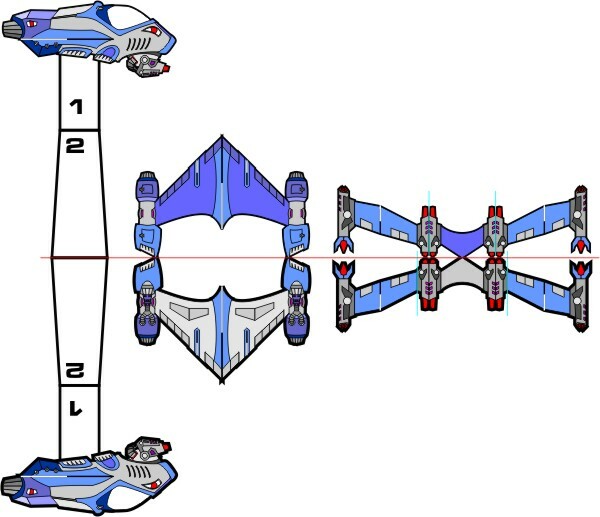 I like your ship design idea... a lot. What type of movement system will you be utilizing? 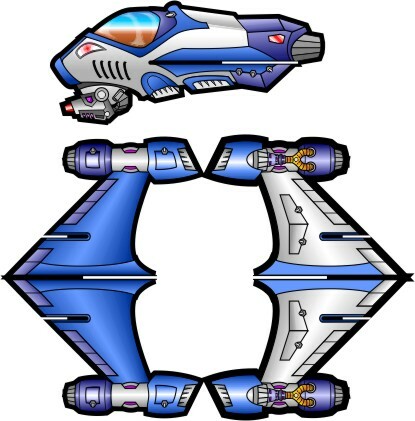 As far as movement system goes, I probably should not have said "space fighter". It will actually be a atmospheric race with my inspiration coming from the real world Red Bull Air Race and the old Playstation game "Wipeout". The movement system I'm working on will hopefully be a balance of realism and playability. Basically tighter turns at faster speeds will be more difficult than shallow turns at slower speeds. Adding climbing and diving maneuvers adds to the difficulty based on the severity of the altitude change over the distance traveled. I work in basic color blocking and simple line weights to get the basic shape traced. Details in the sketch like the vents and lights have been covered over, but will be drawn in next by removing the fill on the body so I can see through it. 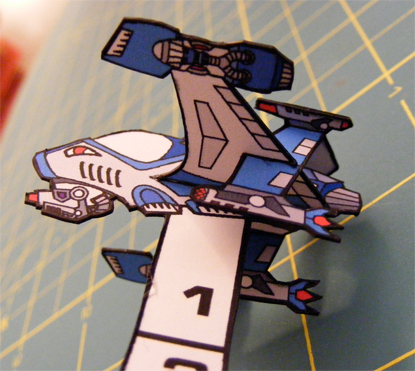 The gun turret is next and then <edit: I finished the basics of the turrent during my lunch break> Onto the wings. 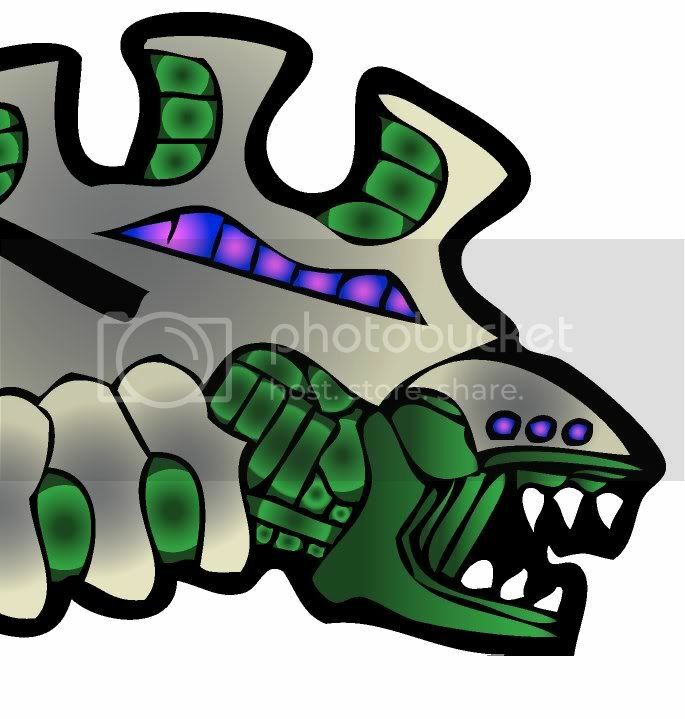 I also have to design and sketch the tail fins/spoiler wing that's in my head but has not made it to paper yet... Where is that direct neural link when I need it??? Where is that direct neural link when I need it??? That is shaping up great... I really like your ideas. I've made a test print and hopefully I'll be able to test build tonight with photos to follow. In case anyone is wondering the numbers on the base support correspond to a flight stand that I'm also working on. 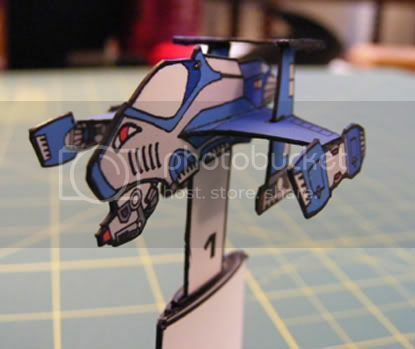 The flight stand's basic design can be seen HERE. Looking brilliant; can't wait to see your test build. So, what, the wings are forward swept, and the tail slots into the back edge, looping overhead? Exactly! Nice spatial relations skills! I have the test build nearly complete and all the parts seem to go together fine. I should have photos tomorrow. I have begun texturing and fixing the color fills and line weights. Top banana, son. This board really needs a thumbs-up smiley. Can't wait to see the build version! Here are the photos of the first test build. The design works but I need to continue to work on the textures and test printing. I think I may have to go back to the "star-field" version of the flight stand as the black lines show up poorly on the white version. I love it It looks very sweet and sleek! Great job! You're becoming quite the 2.5D model designer! I look forward to every one of your releases! Man that is cool assembled. 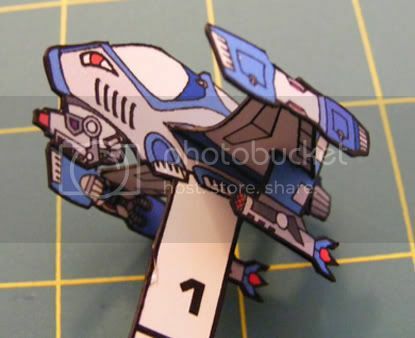 I wonder, how do the gun pods on the wing tips look if they are folded down parallel with the main fuselage? That looks fantastic! Have you tried what Floyd suggested, bending the wing pods down? I have a feeling that could work quite well. Son??? According to your profile, I'm two years older than you, "Pops"!!! 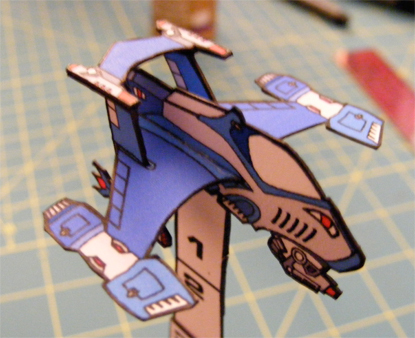 In fact, in my day, we didn't have no fancy downloaded paper miniatures. 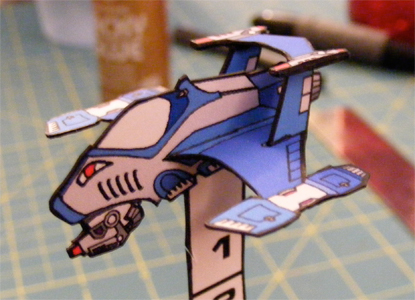 If we wanted paper miniatures, we had to carve them out onto wooden blocks, load them into our Gutenberg press, and press them out onto papyrus using crushed up beetle feet and squid snot as ink. Then we glued them together with melted boar fat and goat saliva, and then cut them out with a sharpened stick. We then set up our battlefield wargame and were them promptly burned at the stake as heretics. And we liked it!!! Thanks for all your compliments! Floyd- great idea to fold the pods down! I'll try that tonight. Okay, I'll call you Grandpa next time. This is has turned out to be a SWEET project! Like I've said before, you are fast becoming the 2.5D wizard around here. I have one question though, I'm not quite understanding the numbered base and how it works. I follow the removable risers as presented in your previous links, but it seems as the current model doesn't have removable risers? Thanks! You're not missing anything. The rest of the base is on a separate page that I have not posted yet. When I've tested everything, finished all my color variants, and made up some directions, I will probably combine them all in one PDF. I don't have my own website, but maybe I can email them to anyone who is interested. As far as the numbers go, as the base is extended the highest number shown is the plane's altitude. The lowest number is 1, so that if I want to include ground targets (like a gun turret or a ventilation shaft about the size of your average womp rat), the ground target will be at level 0. The numbers on the first segment (1 and 2) can also be blacked out with a marker, if you want to use a tabbed base, like a hex base. 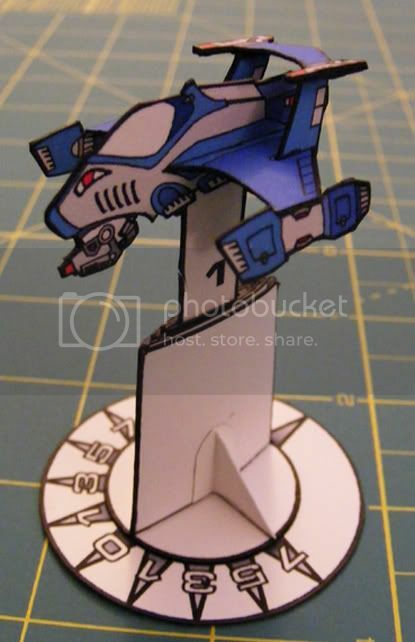 I have not tried this yet, so the model may be top heavy. I don't have my own website, but maybe I can email them to anyone who is interested. Maybe you could upload them to PaperMakeIt!? I've scored and bent down the engine pods on the wing of my test model and it looks great! Thanks again for the suggestion. I hope to have my color variants printed tomorrow and hopefully I can have final builds done by the weekend. I didn't even mention anything about the fighter's "thingypit"! ?? ?Is anyone else having difficulty posting images? I've looked over my previous posts and I find anything that I'm doing differently... Switched from Skydrive to Photobucket! This is just plain fantastic! Like the "dial" style base, what's it for - game wise?